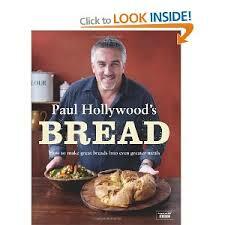 So, I'm in the supermarket with Kurtis and there on the shelf is Paul Hollywood 's Bread book. I have been watching this series avidly and I had to have it. It had five pounds off, no really, it did. My first make will be the Curried Naan with Sultana and the Chickpea Curry. No children will thank me for this, but I don't care, just sometimes we get to eat my first choice of ingredient. Kurtis, having just read this post, has just informed me that as he is no longer a child he will indeed eat this without complaint and with enjoyment, so there is light at the end of the culinary tunnel. My other half has been making fabulous bread since someone gave him this book as a present. The baguettes [using a tray from Clas Ohlson] have been particularly successful. And the sourdough starter is happily living in the fridge. Hope you have as good a time with the book too! Hi Angela, I'd seen on your blog that he'd been baking. I used to make basic white bread quite a lot, but I haven't so much recently and this series gave me a bit of an urge to get back into it and try something a bit different. I've heard good things about this book, I'd love to know how you get on. Naan bread and chickpea curry sounds wonderful, although I'm probably the only one in this house who would agree! I'll let you know! I think chickpeas may be a bit of an adult taste! He is rather is dish!! It's the Pork Pie that gets my vote! Otherwise, I only make Soda Bread so the book would be wasted on me.